Produce edible flowers fast and efficiently with these all new Easy Flower Production Kits. 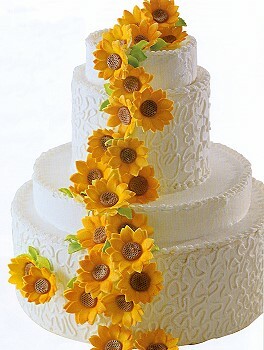 Create an abundant quantity of personalized edible flowers for wedding & specialty cakes. Choose colors, textures and shapes that will blend with your client's event! 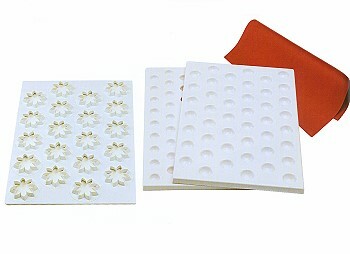 The kits are available in either DAISY or SUNFLOWER patterns and can be used with a variety of edible pastes, such as gum paste, rolled fondant, model paste and pastillage etc. Two Flower Forming Drying Trays, both small and medium forming cups. Overall kit dimensions: 24" x 16" (60mmx40mm), made of white plastic. 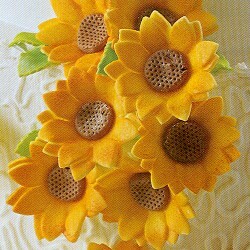 2) Prepare the Flower Cutting Sheet by lightly dusting with powdered sugar. 3) Lay prepared paste over the top of the Flower Cutting Sheet. 4) Carefully lay the Silicone Mat on top of the paste. 5) Using a rolling pin, roll-over top applying a light pressure. 6) Remove the Cutting Sheet and collect excess paste for reuse. 7) Prepare the Flower Forming Drying Trays by lightly dusting with powdered sugar. 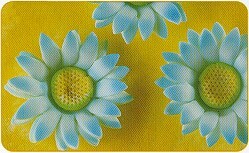 8) Place the cut paste flowers within the Flower Forming Drying Cups by either a single or double layer and allow to dry. 9) Once dry, the flowers can be accented with air brush colors, luster dust, shimmer colors, etc. 10) Create a colorful center stamen to complete each flower. * click on Image Gallery for additional photos.